To say my last blog post is “a while ago” would a grave understatement. Unfortunately, I’ve mainly been busy with something that was entirely new for Nutanix, and with the amount of work involved and the sensitive nature of what I was working on, there was relatively little room left to blog. Especially since I usually ended up blogging about stuff, I stumbled upon while doing my job or researching. This all started with me changing from my presales focussed role to our internal “Solutions & Performance Engineering” team, which focusses on the business-critical applications running on the Nutanix platform. In essence, those applications that are the lifeblood of a company. Applications which, if they are unavailable, will cost the company significant amounts of money. One of those applications is SAP, or more specifically the SAP HANA in-memory database. My colleagues (mainly Kasim Hansia, Rainer Wacker and Alexander Thoma) had already been doing a great job, and all of the SAP applications were certified to run on the Nutanix platform in November 2016. The big question was always “When can we run SAP HANA on Nutanix?”. Working on the answer to this question is what I’ve been busy with the last year or so. While I won’t bother you with the specific details on the business side of things, I do want to take a bit of time to show what it’s like to go through the process of validating a new application. First off, the SAP HANA in-memory database is an application that scales to levels that many people won’t ever see in action. You can run HANA in two ways. You either scale up the resources of a single server, for example running with up to 20TB of memory, or you can scale out by adding multiple servers and distributing the load across all servers. Now, SAP has given the customer two options to select hardware to run SAP HANA. One is an “appliance model” where you choose a configuration as a whole, and everything will run in a pre-tested and validated fashion. You are ensured of a specific behavior of the whole system while running your application. The other option is something called “Tailored Data Center Integration” or TDI in short, where in essence you select your hardware from a hardware compatibility list and have the freedom to mix and match. What we have done is work with SAP to introduce a new third category called “Hyperconverged Infrastructure” or HCI. The HCI category assumes that we are running SAP HANA in a virtualized fashion, and “collapse” several infrastructure components such as compute and storage to an integrated system. The limitations on the maximum sizes for this category are smaller than for the other two categories, but the requirements that are in place for this certification do not offer much more leeway. For example, a storage test to ensure storage performance, where initially log overwrite operations needed to have latency <= 400 microseconds (this changed later on). Another example is a test suite of close to 700 tests that emulate real-world issues, and the performance delta is then compared to a bare-metal installation, with only a specific maximum performance delta between the two giving you a passing grade. All this meant that I had my work cut out for me from the start. We started off working with a server model that wasn’t qualified before, before switching to the validation hardware, namely a Lenovo SR950. A big four-socket server with the fastest CPUs we could use, namely the Intel Xeon Platinum 8180M Processors, 3072 GB of RAM, 3.84TB SSDs and 1.6 TB NVMes. Now, as much as Nutanix is a software company, we do strictly check that hardware meets specific prerequisites to ensure a smooth user experience and to make sure that certain performance metrics are a given. The issue is that all of the checks and functionality in place didn’t work for this new hardware. Simple things like making the status indicator LED for the NVMe light up, or mapping the physical drive locations back to the diagram view in Prism. It meant modifying Python files that handle how hardware is accessed, packaging everything back up into Python egg files, restarting services and then magically seeing drives that the system was able to access. Or passing through NICs so that we could test with “RDMA over Converged Ethernet” or RoCE, and changing BIOS settings to ensure maximum performance. And while pushing the underlying hardware to its limits, it also meant we had to dive deep, and I mean very deep, into the software side of things. From things like experimenting with c-states on the CPU and NIC multiqueueing in the virtual machines, down to changing parameters in our product, ensuring that specific CPU features are passed through, the pinning of virtual CPUs to their physical location or making changes to how often a vmexit instruction is called. I can’t go into all of the specific details since some of it is Nutanix’ intellectual property, but I’ll check what I can share in future posts, and if you have any specific questions, please ask them, and I’ll try to answer as best I can. What I can say is that we pushed the limits of our platform and quite a couple of the things we found are going to be implemented back into the product, and I expect a lot of those changes to show up in the release notes of an upcoming release. Fact is, I learned a ton of new things, and this all culminated in our validation for pre-production use of SAP HANA on Nutanix AHV as announced in https://www.nutanix.com/2018/06/05/finally-can-talk-sap-hana-nutanix/, and we are working full steam ahead on the last steps to get production support. It was and continues to be one hell of a journey, and I just wanted to give you guys a bit of insight into what it is like working on the engineering side of the Nutanix platform, and what a project like this entails. Containers seem to be the hot trend right now. I needed to get some more experience in this area, and instead of working with a single container machine, I actually wanted to get a “quick” distributed setup going. It wasn’t all that quick to start with, but I now have a working setup that can actually be rolled out and scaled in a pretty quick fashion. Your further steps are relatively simple. First off, we will create an etcd master, the most important thing we need is a fixed IP, so define which IP you want to give it. Obviously we could use the CoreOS cluster discovery mechanism and rely on an internet connection, but I decided to just use my own instance instead. Note that I’ve copied in the public ssh key from my laptop to get easier access to the VM. Now, save this file as a text file called user_data, and create an iso image using the ways described here. 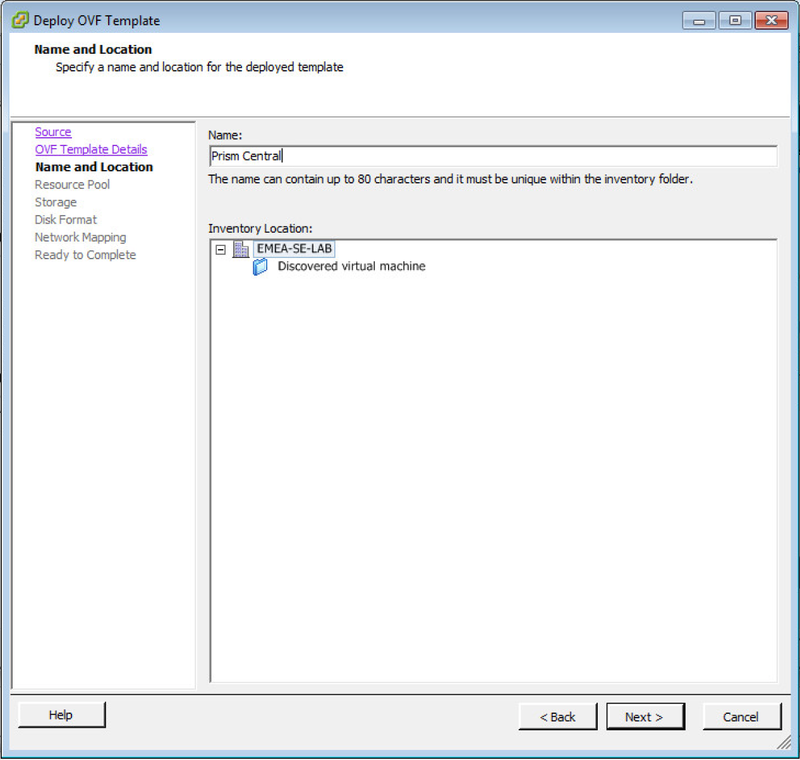 Copy that over to your container on CE using sftp to a controller VM on port 2222. You can use Prism credentials to authenticate. For quick deployment, I’d create a VM that you use as a template to clone from. Give the VM the newly created file as the secondary drive. One of the features that has been announced for Nutanix OS 4.0 (also called NOS), is something called Prism Central. So what does Prism Central do? Well, perhaps things are more obvious if we speak about the internal name we once used. It was referenced as our Multi-Cluster UI, and that is exactly what it is. 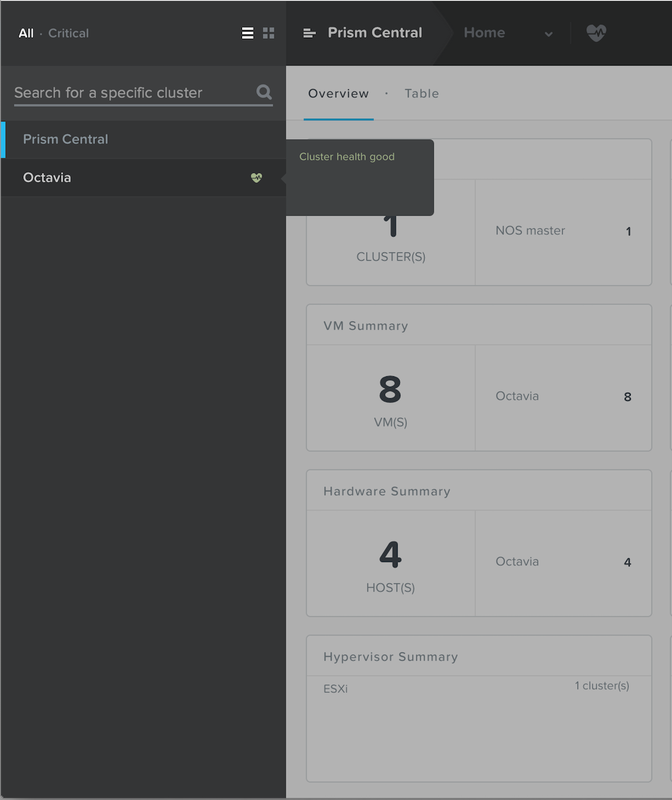 Instead of having to open multiple tabs in your browser and switching between tabs to actually manage your Nutanix clusters, you can now open one tab, register multiple clusters, and manage them all from one interface, or get a basic overview of what is going on across all clusters. First things first: Disclaimer – Keep in mind this is based on an early code version, and things will most likely change before you can download the software. With that configuration, you can monitor 100 nodes while we assume that you can go up to 100 VMs per node. Now, my assumption is that we will be changing to the OVA format to make deployment a bit easier. In this version, I still had to configure the IP addresses manually (no DHCP in my network), and deploying from an OVA should make that a breeze, but I will outline the steps I used here anyway. 2014-04-17 05:51:07 INFO cluster:1531 Success! And voila! 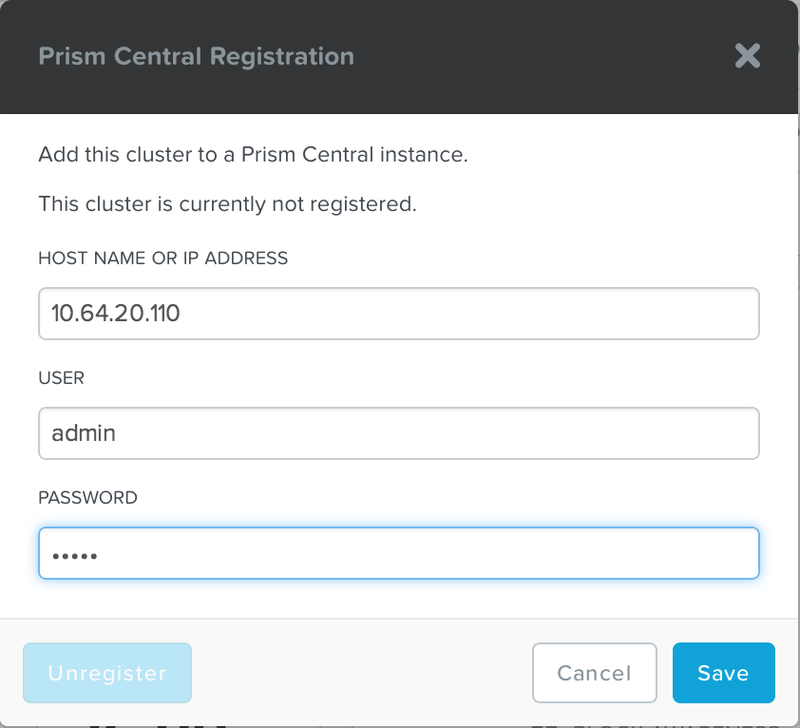 You can now log on to your instance of Prism Central! As you can see, it looks quite the same as the regular 4.0 version, except that if you click on the top left “Prism Central” text, a menu will fold out on the left hand side. But, since we want to monitor a cluster, let’s go ahead and register a cluster. So, that’s it for now. If you have any questions, feel free to let me know. I’m getting more and more customer requests that are looking at alternatives for VMware, and are considering a different hypervisor. 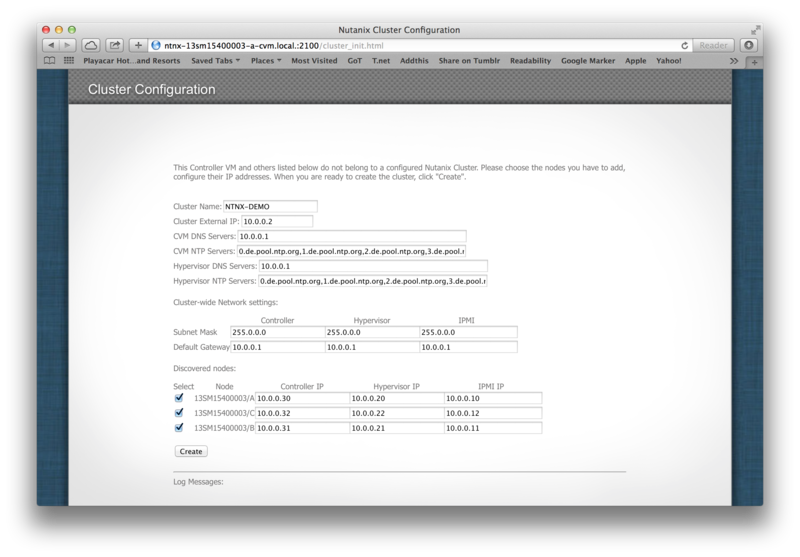 Since I’m more of a VMware guy, but I am always willing to learn new stuff, I figured I might as well share some info on how to set up the Nutanix cluster on KVM, and create an initial virtual machine. By the way, I disabled the background video by simply adding “?novideo=true” to the logon URL. This disables the video, and makes logon a bit faster, especially when working via a link that might not have the bandwidth that you would prefer. I then created a storage pool by the name of “default”, and created a container with the same name. 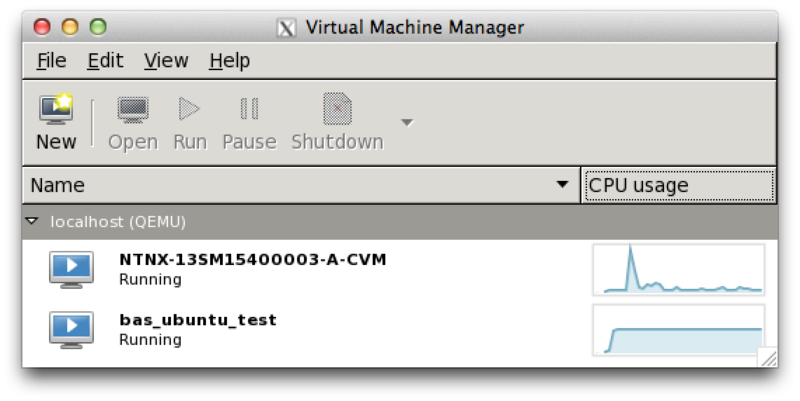 Once that is done, your cluster is ready for its first VMs. 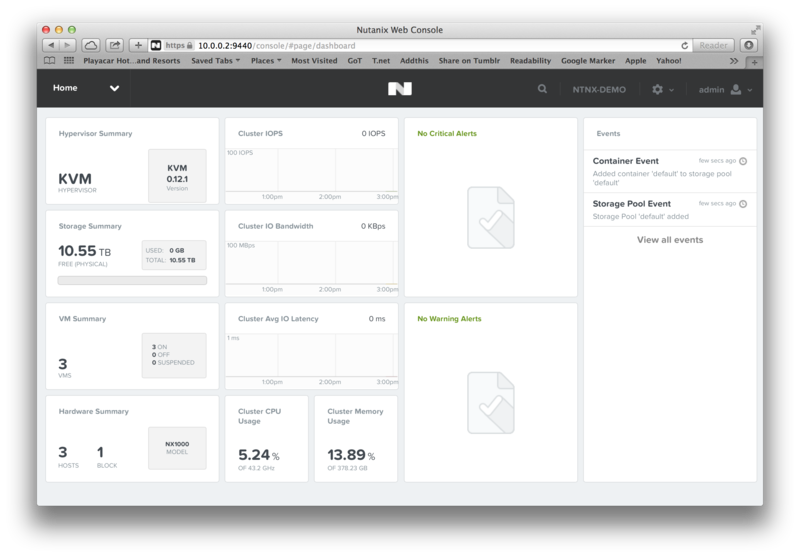 Nutanix – What do you mean: “You are not a storage company”…? “You are a black guy, you must be great at dancing and basketball”. “You’re a blonde? Let me explain that joke to you once more”. Stereotypes. We all know them, we all apply them in some form or the other. We put things in boxes after a quick look, and every drawer has a different label and content to separate the stereotypes. But what if it doesn’t work that way? Since I joined Nutanix, I’ve been in several customer and partner meetings. Some of the people I’ve get got the idea right away. We are doing something new. Others put us in to a respective box or drawer. “You are a storage company” is one of the classic pieces of feedback. Or, “So you do virtual desktop infrastructure?”. But there’s more to it. We offer a combination of commodity hardware, combined with a piece of software, and sell that as a solution. And while the use case of virtual desktops is a great one, we can also run things like Splunk, Hadoop and classic server virtualization workloads. And while we combine the benefits of a shared storage approach to run workloads, we’re not a storage company. We utilize features offered by shared storage to make your life easier. 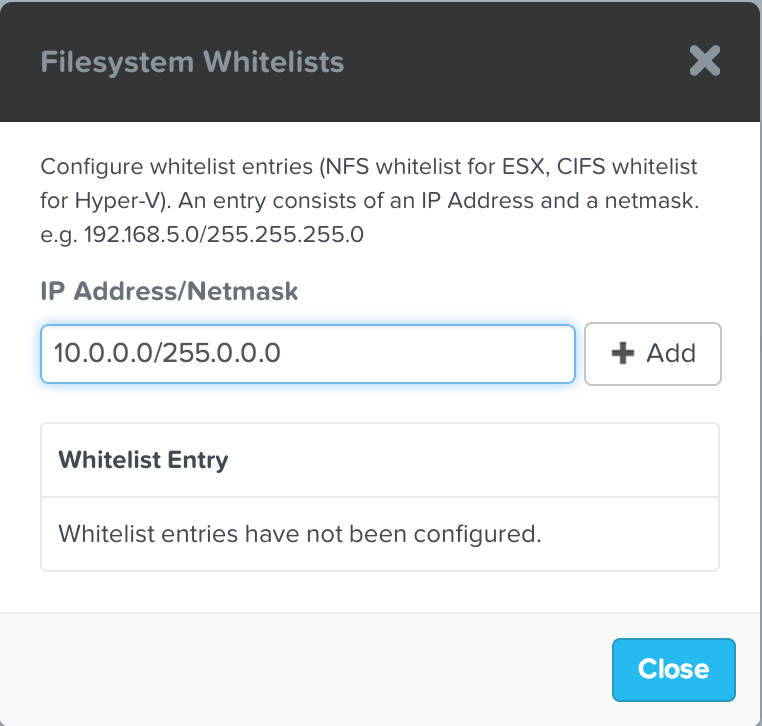 Each node performs its operations on the local storage, but I can use the “Nutanix Distributed File System” or NDFS to create an abstracted layer that offers many of the shared storage benefits. An example would be a shared container for my virtual machines, that are accessible to all of the hosts, enabling features like live migration between hosts. While that works out really well with our customers, and it gives you the idea you have a SAN or NAS underneath the hoods, Nutanix’s main point is not to replace your SAN or NAS. We want to offer you a “Virtual Computing Platform”, a way to make your life easier when installing, configuring and deploying virtualized workloads and solutions. What do you mean: “You are not a storage company”…? A fair question by all means, but the simple answer is: No, we are not. A simple example that seems to come up as of late is the following. How do I share disk space from your file system directly in to a virtual machine? While there is a way to export the storage directly in to a VM (for example via NFS), this bypasses some of the concepts we utilize. By default, we mount a datastore using an NFS IP address of 192.168.5.1, which runs over a virtual switch that has no uplinks. Since we are talking about traffic that stays within the same vSwitch, we can work at blazing speeds that are not limited by the speed of the physical NIC. If I were to mount the NFS share from a virtual machine (or a different host), we could use the external IP of the Controller VM. The problem here, is that since the external IPs are different between controller VMs, if you were to migrate your NFS client VM to a different host, everything would go over the regular network. Also, if the controller VM that you connect to as an NFS Server would be offline, your NFS share is not accessible. The thing is, the Nutanix block is designed to work this way. It offers great flexibility when it comes to running virtualized workloads, but it is not a 100% distributed storage system. We didn’t intend on being a storage system. It then boils down to design. Is there a way around this? Certainly. If you want to create a distributed CIFS file share, take a look at solutions like DFS from Microsoft. You can run multiple VMs inside of a container/datastore, and just pass the disk space of the VM through. If you need more space, just add more VMs on a different node, and add capacity, and off you go. And if you run out of space on your cluster? Just add another Nutanix node, get a VM up and running, and follow the same procedure. That way, you are actually utilizing the distributed nature of our virtual compute platform, and running your storage services in a distributed manner. Gluster FS could be a possible solution to achieve the same thing with NFS on Linux. Upgrading your Nutanix NX-2400 block from ESXi 5.0 to ESXi 5.1 using a USB thumb drive. 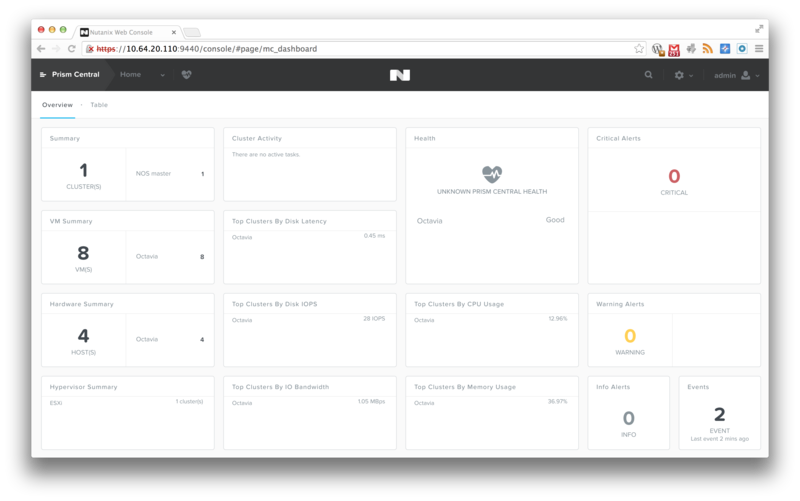 At the moment, I’m lucky enough to have a Nutanix block at home that I use for demos (it’s coming along to Switzerland with me tomorrow). It’s not the model with the highest specs, but it helps in giving customers a chance to actually see the kit, and give partners some hands-on time. In case you are wondering, I’m actually working with a NX-2400, or a 4-node NX-2000 cluster, hence 2400. Thing is though, that it was running an older version of the Nutanix Operating System (NOS), which I upgraded to the latest version (NOS 3.1) without a hitch, and it was running ESXi 5.0. And to play with some of the latest features, I actually decided to upgrade to ESXi 5.1, and I figured I might as well share how that worked out for me. 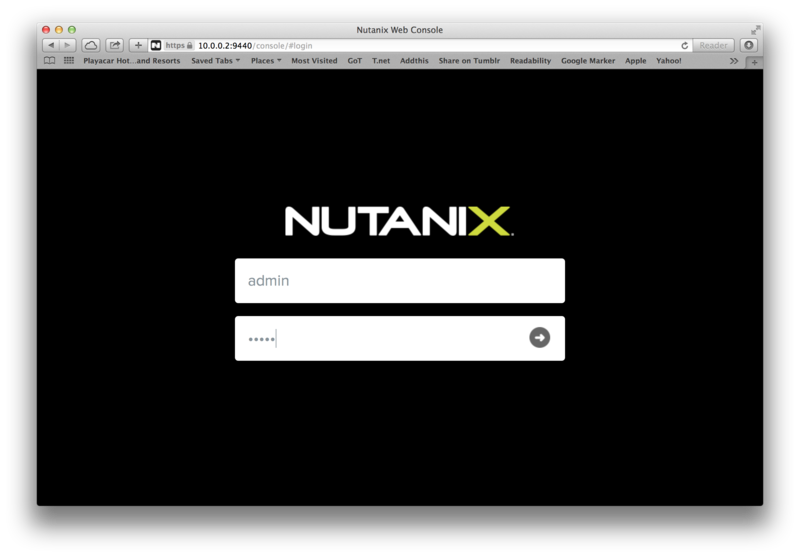 This was done with the latest info from the Nutanix knowledge base. Be sure to check if there are updated instructions available prior to upgrading your own block. So, step one is to actually get the installation media for ESXi 5.1. In case of the NX-3000, you can use the standard ESXi 5.1 image. For the NX-2000 systems, you need to use an image that is customized by Nutanix. Contact myself or your local systems engineer to get the download location. Click on “Disc Image” and select the ISO file. Make sure “USB Drive” is selected, and point it to the correct drive. Then click on “OK”, and watch it go to work. If it gives you a message stating that menu.c32 is already present, click on the “Yes” button. We’ll also need to edit the NFS heartbeat timeout settings. To do that, log on to vCenter, select the node and go to “Software” -> “Advanced settings”. There go to the NFS entries, and modify the “NFS.HeartbeatTimeout” setting to 30 seconds. Do that for each host. Now, obviously this would be easier using the vSphere Update Manager, but this was the solution I used, since I only installed the vCenter virtual appliance. Not pretty but it works. vim-cmd solo/register [/full/file/path/to/the/controller_vm_name.vmx]You might want to rename the controller VM once you have registered it. sched.mem.prealloc = "TRUE"in the .vmx file of you VM. If this line is present, remove it, and re-register your VM.